This is always a mine field and nothing guarantees success but there are a few things to look out for before parting with your hard earned cash. Obviously different countries have different rules but I am sure a lot of the following would apply wherever you are located. The depreciation of used cars is much less than new cars and, therefore, they are a more cost effective purchase. Get your finance in place before choosing your car, this saves time as you know exactly which vehicles you can or cannot afford. Be aware of the current “going rate” of vehicles before purchasing by checking guides available from most newsagents that list the value of most used cars. Consider all different outlets such as trade-ins at new car dealerships, private sales etc., not just secondhand car dealers. Cars less than three years old which have been driven 10,000 – 15,000 annually are probably the best buys. An average annual mileage is about 10,000, so for a 3 year old car mileage between 25,000 and 35,000 would be reasonable. Anything over this could have been used for business and driven hard. Small and medium saloons and hatchbacks are easier to maintain and repair than convertibles or luxury cars. Check the engine plate on the car corresponds with that given on the registration documents and that it has not been tampered with or changed. Never buy a car without test driving is yourself. First make sure you are insured to drive it then, if possible, take it on a drive that covers a mixture of conditions i.e. fast motorway driving, slow urban driving, twisting roads and don’t forget to check reverse. Look for corrosion or rust. Rust is probably the most damaging thing of all on cars over five years old. Surface blisters can be relatively harmless and easily treated but corrosion coming from the inside of the body panels is more serious. It is usually not worth repairing rust that has perforated the bottom of doors, the bodywork around the front and rear screen rubbers, on trailing edges of boot lids or tailgates and leading edges of bonnets and on rear wing panels. These can only be repaired expensively by specialists and subsequent painting is costly. Beneath the car check side sills, chassis legs, cross members and subframes. Tap suspicious areas with a lightweight hammer, or push hard with your hand to detect the ‘give’ of weakened metal. Be wary of freshly applied underseal – could be hiding weakened metal. A car that has been in a collision can be dangerous, especially if its suspension and/or steering have been damaged. Examine under the bonnet for damage, creasing or replaced inner wings (unsightly welds are a give-away). Also inspect the engine bay forward panels and forward chassis legs for repairs or creases. When test driving the car the steering should be consistent with no tendency to pull either left or right. Look under the carpet between the front and back doors for signs of welding or repair in case two halves of different cars have been welded together (cut and shut), which is extremely dangerous. Look to see if the mileage corresponds with the general condition of the car. A worn brake pedal and wear marks on the gear lever indicate a car that might have done more than 60,000 miles. A worn or sagging driver’s seat and carpet are other signs of high mileage. A very low mileage may indicate the car might have been left unused for long periods or used only for short journeys. Both can cause engine problems. A car that has been regularly used and serviced is a better bet. Have a look at the general state of the engine. A dirty engine and surrounding area suggests that the car hasn’t been well looked after and that servicing may have been neglected. Conversely, a sparkling clean engine could have been steam cleaned to disguise problems such as oil leaks etc. Before starting the engine remove the dipstick and check the colour of the oil. If it is very black the car has probably not been recently, or regularly, serviced. Also check for beige “mayonnaise” on the dipstick, a possible symptom of head gasket leakage. Listen to the engine starting up from cold. The oil light should go out soon after the engine starts, if it doesn’t there may be engine wear. Heavy rattling or knocking noises shortly after start up could indicate wear of the crankshaft and big-end bearings. Listen for clattering or light knocking noises from the top of the engine which indicate camshaft wear. Turn on the ignition and open the throttle sharply. Check for black or blue smoke from the exhaust. Blue smoke comes from burning oil and shows engine wear, whereas black smoke is un-burnt fuel and has many possible causes. Check for smooth idling when warm. When test driving check the engine does not misfire but pulls strongly and cleanly. Check there are no pinking sounds (i.e. metallic rattling sound that occurs when the throttle is open). If the car does misfire and the engine has electronic fuel or ignition control only buy it if the misfire is put right first. Keep an eye on the temperature gauge or warning light which may indicate overheating. When driving change down into each gear from a higher speed than normal to test the synchromesh. If the gears baulk or crunch, or if the gearbox whines excessively, gearbox overhaul or replacement are the only solutions. If the car has automatic transmission check the transmission dipstick for correct fluid level, this is best done with the engine hot and idling. Also smell the dipstick, if it smells burnt steer clear of the car! When driving check that the transmission changes down into each gear properly under full acceleration and at the right time. Check shock absorbers (dampers) by pushing down hard on the bodywork at the corners and letting go. The car should rebound once just past the level position, then go back i.e. one and a half swings. Any more than this indicates the shock absorbers need replacing. Listen for knocks from the suspension over poor road surfaces which could indicate worn bushes, joint and dampers. Take a note of the cars handling, if it is vague, “floaty” or bouncy, suspect worn dampers. Check for fluid leakage from the dampers or struts. Slight weeping is acceptable any more is not. If the steering is vague and heavy the tyres may be worn or under pressurised. Check for wheel wobble at speed. This is often attributable to unbalanced front wheels. Steering wheel shimmy at low speeds indicated distorted wheel rims. The care should not swerve when the brakes are applied hard at speed. If it does, it may have seized or leaking wheel cylinders or calipers. If the car judders when you apply the brakes this implies distorted front brake discs. Inspect discs for heavy scoring or unpolished or corroded areas, they may need renewing. Check the treads and side walls on all four tyres (plus spare wheel) there should be more than 2mm of tread all over the tyre (I think the legal limit is 1.6mm in the U.K. at present) and the sidewalls should not be cracked or damaged. Uneven wear on treads suggests steering, tracking or suspension problems. Ask to see service and repair history and well as repair receipts. Treat a denial that these receipts exist with suspicion. Check the car’s registration and chassis number matches those on the registration document. If the vendor is not the person named on the registration document ask for written confirmation from the registered owner that the vendor is authorised to sell the vehicle on his behalf. Ask if it is permissible to have the car inspected by an independent mechanic. If it is (and you can afford the added expense) ask the mechanic to carry out a cylinder compression test to assess the condition of the engine and also to estimate the cost of any repairs he thinks may be warranted. You can then ask for the cost of these repairs to be deducted from the asking price. 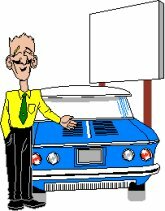 If you have a car to trade in don’t mention the fact until you have negotiated a discount for the one you want to buy. If you are buying from a trader, depending on the value of the car, it may be worth investing in a warranty. Read the warranty small print very carefully as some warranties exclude more than they cover.